Mantel with Storage - MITRE CONTRACTING, INC. This months finish caprentry project includes designing, fabricating and installing a craftsman / shaker style mantel for a Northern Virginia homeowner. This fireplace mantel was designed and constructed to enclose a sound bar for the flat screen television. The mantel was designed with flat recessed panels and simple lines to give it a craftsman style look. The storage compartment has a removable metal screen panel to get access to the space. We also made a solid wood panel that would give you a concealed storage space. The mantel construction is solid wood (poplar) with custom made crown molding and a custom made square bead molding for the removable panels. The mantel was a little taller than a normal mantel as the fireplace was raised off the floor around eight inches due to a raised hearth that was removed during the remodel. Here are a couple close up pictures of the mantel showing the crown moulding and showing the removable panels. Here are a couple picures we took during the installation, showing the unpainted mantel, and also one showing the hidden storage compartment where the homeowner will place the soundbar. We completed this mantel surround feature this summer of 2013 for a homeowner in Vienna, VA. We designed the look of this fireplace mantel from several mantel inspiration picture ideas they had submitted to us. Please contact us if you would like us to custom build a fireplace mantel in any design style. Other finish carpentry services we offer to our Northern Virigina customers are: molding installations ( baseboard, chair rail, crown mould, wainscot, panel molding shadowboxes, archways, built-in cabinetry, built-in entertainment centers, built-in bookcases, coffered ceilings, beadboard ceilings, window & door casings, stair railings, bannisters, balustrades, baluster replacements, etc. etc. Please call us anytime at 703-330-3486, or email us, and let us provide you with a free in home consultation and free no obligation price quote for your next home improvement project. 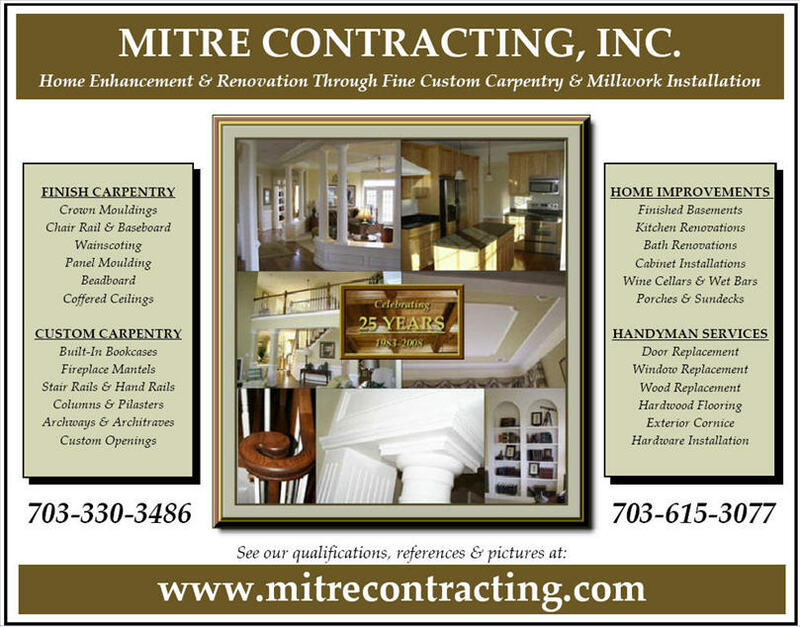 We perform our finish carpenter & interior trim carpentry services for the entire Northern Virginia area and several surrounding counties.